Bitcoin stabilized, went up, went down and now is going up again. The ride has been wild and the opinions on the outlook in the market have been shifting. We hold a steady course and strive to filter out all the noise to give you the most relevant information. An there’s rarely a more important time than now for that. The tide might have turned and we’re on the lookout for a confirmation of the trigger. Such a confirmation could increase the profits on our hypothetical position. South Korean prosecutors raided the country’s biggest cryptocurrency exchange, Upbit, on Thursday and Friday on suspicion of fraud, Yonhap news agency reported. The agency did not give details. Neither Upbit nor the financial investigation team of the Seoul Southern District public prosecutors’ office was immediately available for comment..
Upbit sent a note to its clients that it is co-operating with the prosecutors and that it can guarantee that all its clients’ assets are secure. Four executives from two other South Korean cryptocurrency exchanges were detained in April in connection with the alleged embezzlement of billions of won. It is important not to panic at this moment. The government is not out there to get your bitcoins. The action of South Korean prosecutors is most likely an extension of their usual activities. The only special thing about the whole situation is that it involves Bitcoin. For the government, it doesn’t really matter if potential fraud is committed with checks, credit cards or Bitcoin. Sorry if this doesn’t quite sound as exciting as a conspiracy theory involving malicious activities on the part of the South Korean authorities. But we would rather give you a story which is true than one which is exciting but false. The one thing to keep in mind as a Bitcoin trader is to always conduct your own due diligence before committing funds to any particular exchange. Review the legal standing of the exchange, check the opinions of its users and so forth. However, even if a specific exchange doesn’t do anything inherently illegal, it is still possible that the regulator doesn’t have a full grasp of the concept of cryptocurrencies and might overreact to Bitcoin exchanges. It might be wise to diversify between Bitcoin exchanges in order to not have all your funds locked into one specific platform. On BitStamp, from the short-term perspective, the recent rally and the subsequent move down have given us the opportunity to apply Fibonacci retracements to the recent local top, which was not really possible earlier. This analysis shows that something important might be going on in the market. 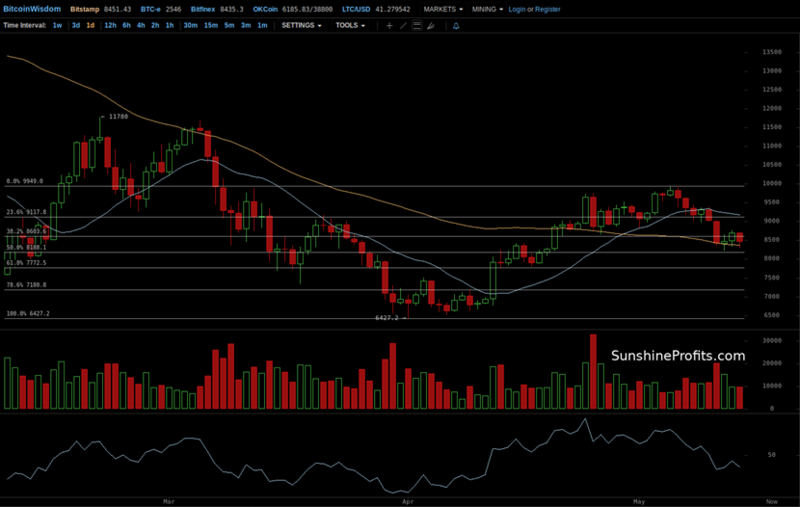 Bitcoin went down from the recent local top and right to the 38.2% retracement. This might be significant for the next couple of days. At the moment of writing these words, the currency is fluctuating around this level. If we see a confirmed move below this level, the move down might accelerate. It is possible that we could see a move up from here, but the move might be limited by the level of the recent local top around $10,000. 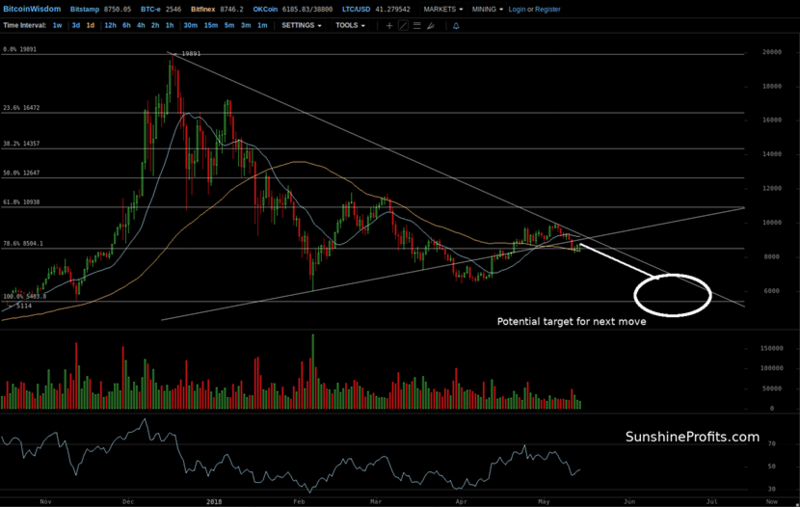 On the other hand, the move down might bring Bitcoin down to around $6,000-6,500. It increasingly looks like the recent consolidation might be over and the move down might resume from here. On the long-term Bitfinex chart, we see that the move down of the last couple of days has brought Bitcoin to yet another Fibonacci retracement level. This time, we have the 78.6% level based on the move from around $5,500 to around $20,000 in mind. We have mentioned a couple of times in the past that this level is not a particularly strong one as far as the bullish implications are concerned. The situation now is slightly different. The 78.6% level might not be as important as other levels but the fact that we are now back at this level and that the recent appreciation has been denied might be taken as a mildly bearish indication. If we see a confirmed breakdown below this level, the implications might become slightly more important. Another bearish indication comes from the fact that the recent moves to the downside seem to have transpired on higher volume than the recent moves up. This might suggest that the momentum is now shifting to the downside as far as short-term action is concerned. From the long-term perspective, we are seeing that the recent rally might have been simply a correction within a larger decline. As no significant bullish indications have emerged and we have some bearish hint and the general trend to the downside, the situation remains bearish. If we see a bearish trigger, like a confirmed move below the 78.6% level, we might have an acceleration of the decline on our hands. Actually, if you consider the rising resistance line based on the February and March local lows, we might have seen a confirmed move down, a confirmed slowdown in the rally and a potential bearish trigger. Whether the decline accelerates immediately or we have to see more bearish confirmations, the current outlook remains bearish and the profits on our hypothetical positions might increase. We are looking for this trigger for you. Summing up, the tide might have turned and we might have more declines on our hands.